by John - March 30th, 2018. 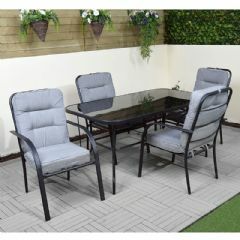 Stylish and elegant this fabulous Greenfingers Crotone Steel 6 Armchair 150cm Rectangular Dining Set is perfect garden furniture for entertaining al fresco on warm summer days. It is both attractive and contemporary in appearance and will complement any modern garden. 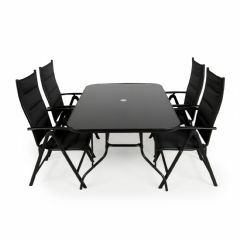 The superb table features black powder coated steel framework with 8mm tempered glass and there is a parasol hole is in the centre to allow for shading should the sun prove too much. The comfortable chairs are made from powder coated steel making them lightweight and durable and the seating is made from poly-textile which is a great material should any sudden showers strike as it is very quick drying. The chairs are also stackable for ease of storage.This Greenfingers Crotone 6 Seater Set is the ideal size for your patio or decking and it complements any style of garden. 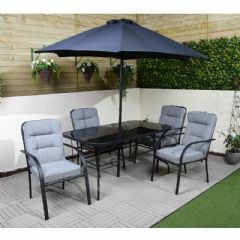 It is a great quality garden furniture set that makes a great investment and is well worth the money for its durability alone. 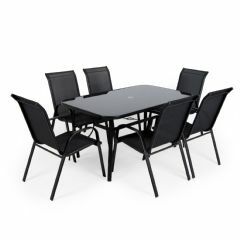 8mm BS7376-2009 glass standard Dimensions:Table: L152.5 x W96 x 70cm highParasol hole: 5cmChairs: W54 x D75 x H95cmArmrest height: 60cmLoad capacity: 120kgPlease note: all garden furniture should be stored in the winter and caution taken during windy conditions. Please do not leave a parasol in the table unattended. Greenfingers recommends that all furniture is protected during the winter either by covering with furniture covers or storing the furniture indoors. All Greenfingers Garden Furniture arrives flat-packed and will require some assembly. An impressive addition to your garden this superb Greenfingers Lorenzo 4 Seater Reclining Set is a great investment that can really encourage you to spend time outdoors. 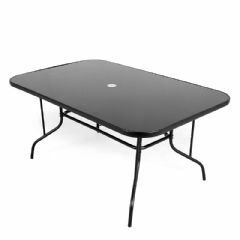 The glass-topped table is the perfect size for entertaining al fresco on warm summer days with your friends and family. It is both stylish and contemporary in appearance and elegantly comprises a black powder coated steel framework with 8mm tempered glass. It also features a central parasol hole to allow for shading should the sun prove too much. The equally stylish black padded recliner chairs are not only extremely comfortable but also feature 7 reclining positions. Manufactured from sturdy aluminium with poly-textile fabric these robust chairs also fold easily for storage when not in use and are quick to dry should a summer show strike. 8mm BS7376-2009 glass standard This fabulous garden dining set complements any style of garden patio or decking. 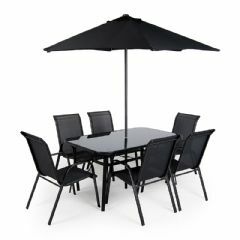 It makes a great investment that is well worth the money for its durability alone.Table: L152.5 x W96.5 x H70cmSteel rim: 36 x 15mmParasol hole: 5cmChairs: L65.5 x W55.5 x H105cmLoad Capacity: 120kgReclined: L98 x W55.5 x H82cmPlease be aware that the chairs are not suitable for young children. Please note: all garden furniture should be stored in the winter and caution taken during windy conditions. Please do not leave a parasol in the table unattended. Greenfingers recommends that all furniture is protected during the winter by covering with furniture covers. All Greenfingers Garden Furniture arrives flat-packed and will require some assembly. Make the most of dining outdoors in your garden with this very stylish Ellister Siena Glass Table. 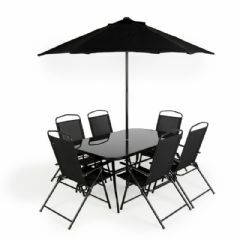 Manufactured from black powder coated steel with 8mm tempered glass it features a central parasol hole should you wish to shelter from the sun. It is a lovely table that will easily accommodate your friends and family and is easy to clean too. This stylish contemporary table is durable and sturdy making it ideal for garden furniture. 8mm BS7376-2009 glass standard Dimensions: L152.5 x W96.5 x H70cmSteel rim: 36 x 15mmParasol hole: 5cmPlease note: all garden furniture should be stored in the winter and caution taken during windy conditions. Please do not leave a parasol in the table unattended. Greenfingers recommends that all furniture is protected during the winter either by covering with furniture covers or storing the furniture indoors. All Greenfingers Garden Furniture arrives flat-packed and will require some assembly.